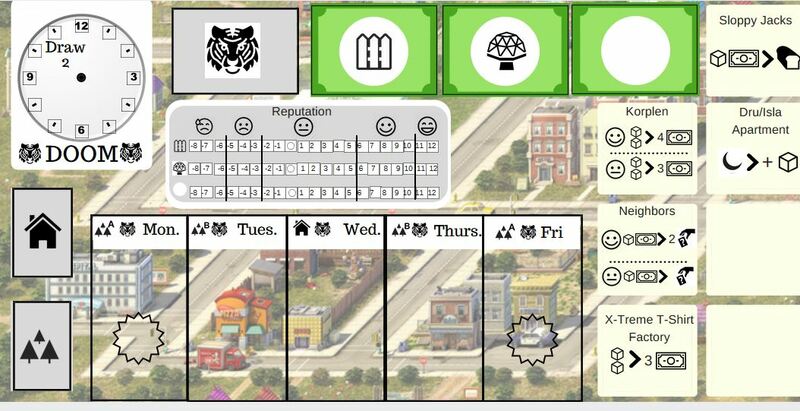 In this entry, I want to talk about a few of the many changes to my board game prototype Townies over the past three months. If you’ve just started reading, feel free to check out my earlier Townies design diaries here: Part 1, Part 2. The original conceit of Townies was that players would exist in a sandbox that thematically and mechanically represented a real town. Characters would struggle with the day-to-day necessities of their jobs, household responsibilities, and chores, while solving a larger existential crisis in the town. A bartender, for example, would try to goad other players into purchasing a drink at their bar, while also investigating the mysterious noises outside her house. I wanted to create the same feeling in Stranger Things (and many other movies in the genre) where the group is solving a larger mystery while also going to school the next morning. The town of Peorium was similarly designed with simulation in mind, it had: a store of rotating goods, two searchable locations, a market of commodities that would adjust when players bought or sold things, two types of currency (gold and cash)…maybe you see where this is going. With so many mechanisms in play, the board size, the teaching time, and Townies’ complexity swelled. But was it any more fun with these things included? Sure, it all “worked”, but as the game got mechanically more complicated it was a bear to teach to new players. If simulation and abstraction are two ends of a spectrum, I was way on the simulation end in my thinking. The problem was the audience I imagined playing and enjoying Townies were the mid-weight Euro players, and storytelling game lovers. My favorite mechanisms in the games that I love are ones that are relatively simple to learn, but create complex decisions — think Food Chain Magnate, Nations, or Concordia. Using this method, theme can then be created as economically as possible. So I started cutting things out right and left. What got cut, and why? Daily Task List– In earlier versions, characters had specific tasks they needed to complete each day of the week. Tasks were thematically tied to the characters’ lives, such as “Garden on Tuesday”. The tasks were a lot to take in for new players, and giving players non-sharable missions made decision making non-collaborative. Now, there’s a shared pool of faction-related missions, and players collectively choose one each. Cut. Writing Mechanism – This was a really fun mini-game idea: players would draw cards, and then turn them in to make three-to-four letter words a la Scrabble. Thematically this represented writing a work report or blogging (yay blogging!). The rules overhead to explain and make this happen were a pain though. Cut. The Rotating Store – Originally players obtained items through a store of rotating goods. Playtesters were constantly forgetting to rotate the last item out of the store (needless upkeep), and no one ever bought anything. Maybe this could have been tweaked, but the game seems to be working fine with players gaining items based on story decisions. Cut. Commodities Market – As I mentioned earlier, I used a market similar to the one in Glen More, which where the price of resources would fluctuate based on what was bought and sold. This is a neat way to model the supply and demand of resources. In practice, checking and changing the price for materials every time one was bought and sold took too long, and didn’t create any interesting decisions. Cut. Phew! That’s a lot, but don’t worry there’s still a lot left. Now Townies sits somewhere in the happy middle between simulation and abstraction, lots of theme and still easy to teach. I also have included some really cool story-based elements of increased simulation, but these are implemented in short bursts, with low rules overhead. In conclusion, I want to reiterate what many others have said: every rule added should add fun to the game. Each rule takes a spot in the players brain, so make sure it adds more fun than the upkeep it takes to remember! So that’s it for this week. Have you struggled creating theme without going overboard on simulation? Let me know in the comments, and please subscribe if you would like to see updates on current projects and recent articles. “Onett Town Map” background by Christopher Behr used in rough board image above, see his Artstation page here.